Pressing flesh and free sandwiches: all part of the process for FEG chief Henry Carr. Sandwiches and sympathy: FEG chief Henry Carr. 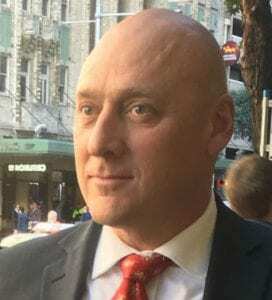 The man doing all he can to eliminate complacency around circulating assets and the uses to which they can rightly be put was in Sydney this week, presenting to those most at risk of transgressing his rejuvenated enforcement regime. On Tuesday FEG recovery czar Henry Carr was at the boardroom of John Morgan’s BCR Advisory on Spring Street. It was lunchtime and Carr, who is spearheading the Department of Employment’s (DoE’s) efforts to recover some of the small fortune dispensed each year via the Fair Entitlements Guarantee Scheme (FEG), had turned up to clarify matters to those practitioners most alarmed and least equipped to deal with his ominous please explain missives, many score if not hundreds of which have been issued to practitioners big and small since Carr unleashed his blitz on the improper use of proceeds from circulating assets last year. SiN’s informants advise that there were about 20 members of the fledgling Association of Independent Insolvency Practitioners (AIIP) in the BCR boardroom on Level 10, including Louttit & Associates principal Jamieson Louttit, BCR’s John Morgan, Helm Advisory’s Stephen Hathway and Adam Preiner, Guy Baxendale from Baxendale & Associates and Angus Gordon from Macquarie Gordon & Co.
Carr, it was said, gave a robust defence of why he and his FEG Recovery Team are scouring cases to ensure receivers and liquidators have dealt appropriately with the proceeds of circulating assets under their control. Carr also explained in conversations with some of those attending that the relevant issues around sections 561 and 433 of the Corporations Act only apply when a secured creditor is in the picture. Without a secured, Carr apparently told them that the priority payment waterfall under section 556 applies. That means FEG’s entitlement gets satisfied after the liquidator is paid, not before as in the secured creditor scenario. That of course won’t soothe the nerves of those who’ve already received one of Carr’s please explain letters, drafted by the omnipresent Arnold Bloch Leibler. Carr told the AIIP crowd that he’d come across a number of situations that could not go unchallenged, but was committed to being fair minded about what he described as the “honourable trade on”. In this scenario, the appointee in good faith utilised circulating assets to trade on the business because he or she held a legitimate expectation that by doing so, a superior result would be achieved for creditors. But the attempt proved fruitless. In such an event, Carr intimated that he would be happy to sit down and come to a resolution that was commercially acceptable to all, providing of course that the appointee could demonstrate that the original expectation was justified and the outcome impossible to foresee. The AIIP lunch also gave its members an opportunity to vent to Carr about FEG’s latest questionnaire. SiN has learned many practitioners have received FEG questionnaires relating to appointments where there is no secured creditor and that a view has crystallised among recipients that they should charge the DoE $1500 plus GST for the time taken to complete the 25 question form, which emanates from a different part of the FEG unit to that part within Carr’s dominion. Carr is also apparently trying to revive interest in FEG’s litigation funding model, announced with some fanfare last year but which would appear to have not set the industry alight. Perhaps if IPs weren’t quite so distracted with questionnaires, and threatening please explains? 1 Comment on "FEG chief open to the “honourable trade on”"
It is great to see a creditor (FEG) being active and also taking an interest in various administrations. Practitioners are trustees of estates and beneficiaries should be able to question the actions of the trustee. This is great for the industry and I am not sure why Practitioners are up in arms about the actions of FEG. I am currently liaising with FEG on one of my administrations and it seems (from rumours) that the members of the Association of Independent Insolvency Practitioners (AIIP)are all having their own issues with FEG. Also what happened to ARITA? why the need to start the AIIP……..